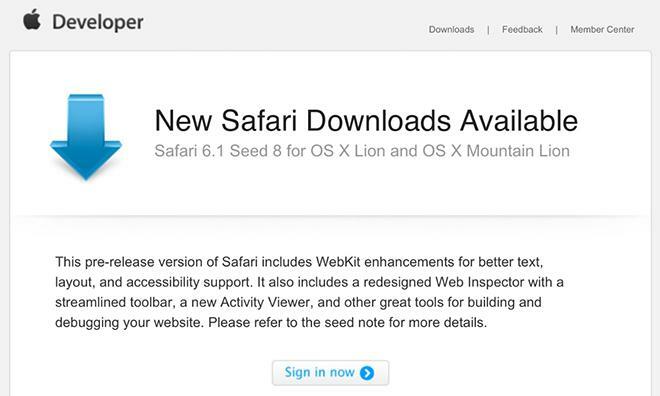 Ahead of an expected release later this year, Apple on Monday made available Safari 6.1 Seed 8 for OS X 10.7 Lion and 10.8 Mountain Lion with WebKit enhancements, among other updates. According to AppleInsider reader Gregg, developers were sent an email from Apple, as seen above, announcing the latest build of Safari as well as a link to download the software. Apple notes that enhancements include WebKit tweak for text, layout and accessibility support, as well as a redesigned Web Inspector and a new Activity viewer. The new tools are meant to make debugging websites an easier process. Safari 6.1 Seed 8 comes around a week and a half after the last release. Developers can download the newest seed from Apple's Developer portal.